Discussion – After having made contact with Brian and given him the background to your proposed tartan – personal, family, fashion or corporate – he’ll ask you a series of questions looking for relevant historical and contemporary design elements that are of unique significance to you. It will be those that will dictate the shape and content of your new tartan and provide you with not only a distinctive visual identify for the present, but preserve that ‘snapshot’ of you, your family or business that will last into the future and make ‘tomorrow’s history’. Draft Designs – Armed with those facts and your brief, Brian will – usually within a matter of a few weeks – supply you with a minimum of three draft designs. For convenience and ease of dissemination around family or colleague, these are normally supplied as email attachments but can be produced as hard copies if necessary. Final Design – Once you’ve reviewed the designs and the design rationales, it will be decision-time! If you have a favourite but would like some slight modifications then that’s quite acceptable and Brian will work through your requirements until you’re completely satisfied with the final design. Registration – Next step is to Register the design in the Government controlled Scottish Register of Tartan which Tartan Ambassador Ltd., will automatically undertake at no extra charge. 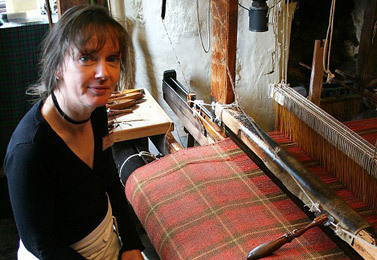 It should be mentioned here that there’s no legal requirement to register your tartan but most folk will want the satisfaction of knowing that their new tartan is documented in a publicly accessible place and – more importantly – it will become part of the archival database that is searched prior to all registrations, to ensure that it’s unique in name and design. Copyright – On payment of the final design fee Tartan Ambassador Ltd., will transfer the copyright of the tartan to you. Completion – The final stage will be providing you with the official Certificate of Registration. Included in the fee is ongoing impartial advice on the choice of fabric and weaver, the range and manufacturers of commemorative or commercial products and any other help needed to maximise the potential of your new tartan. There was a time when if tartan wasn’t woven, it wasn’t really regarded as tartan! Strange as that may seem it was understandable that in the early days, the only way that tartan manifested itself was through the medium of cloth. Technology and the world has moved on since then and common sense dictates that tartan is tartan regardless of the medium used. It’s most certainly seen at its very best when woven and hopefully, your plans will include some weaving for kilts, scarves, ties, skirts, interior furnishings, carpeting and any of a huge range of products incorporating your tartan. But . . . it needn’t be woven at all (don’t let the Scottish weavers hear this!) and you can use it in a multitude of ways – printing onto cloth and an exciting variety of other substrates; using a flash of your tartan on stationery, sales literature, wallpaper, even applying it to vehicles large and small – the largest so far being the tail fin of of a British Airways Boeing 747 – the tartan designed for BA by our colleague Peter MacDonald by the way! Handloom weaving at the Weaver’s Cottage in Kilbarchan. 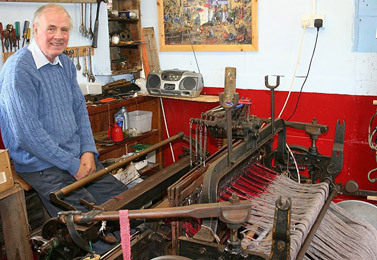 Harris Tweed weaving on the Isle of Lewis, Outer Hebrides. 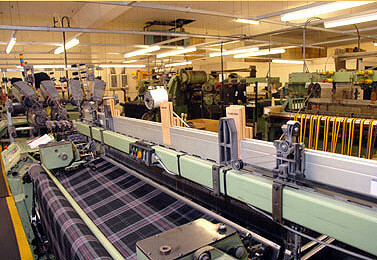 Weaving on high speed looms at Lochcarron of Scotland.